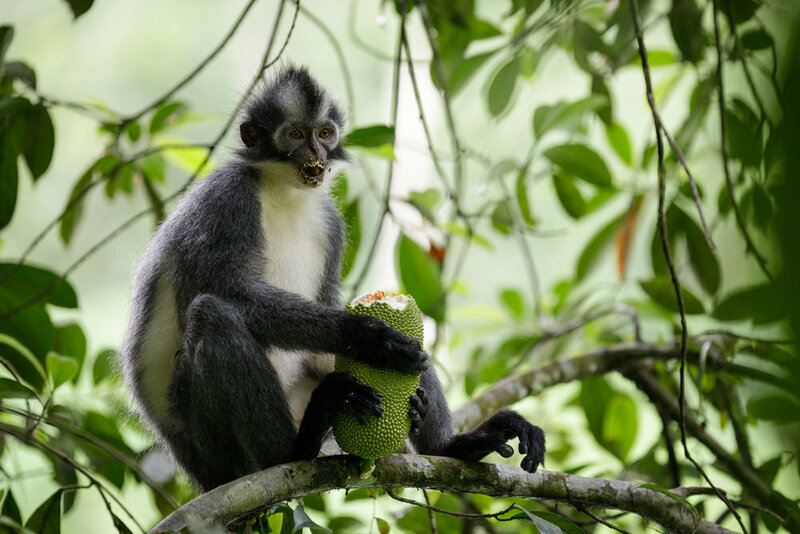 Thomas’s Langur (Presbytis thomasi) eating a huge jackfruit in the jungle of Bukit Lawang, Sumatra. As a professional wildlife photographer, you always want to have tack-sharp shots for your portfolio or clients. Sometimes the images look sharp on the back of your camera when you’re in the field, but then you get home and notice the focus is actually on that branch just behind or ahead of your subject’s eye. This can ruin a photo, making us smack ourselves and call ourselves names. I once went to Shenandoah National Park in Virginia and spent over an hour in the middle of a small herd of deer - mostly does and young bucks. They came so close to me that some of my photos using a 300mm lens were full-frame portraits. It was amazing and I could not wait to get the photos home and onto the computer so I could share them with the world. Unfortunately, when I got home I was incredibly disappointed with what I saw on the computer monitor. Most of the images had missed focus, focusing instead on a tree or branch about six inches to a foot behind the deer. I was heartbroken. After researching the problem, I discovered the AF Microadjustment setting (on Canon; AF Fine Tune on Nikon). With this setting one can adjust where the focus hits, either closer to or further from the camera than is the lens’ standard setting. I bought a focus calibration tool on Amazon and got to work as soon as it arrived. The process is easiest to do tethered to a laptop so you don’t have to keep switching the SD card from the camera to your computer, but you can also do it from the LCD screen on your camera. Once you have your focus tool, set it up and put your camera on a tripod. Set the camera so that it is perfectly level - not tilting to either side and pointing perfectly straight rather than tilted up or down. Put the AF point in the center of the frame and point it at the center of the focus tool. Set your camera to shoot JPG since we are looking for speed over image quality. Now take several pictures - one at -15, -7, 0, +7, +15. Check these five photos to see which has the best focus, that is sharp on the “0” but fading out evenly to the other numbers. When you find the one that is closest to correct, take five more photos in that area. For example, if the -7 photo was closest, take five more photos at -5, -6, -7, -8, -9. Repeat this process until you think the focus is set perfectly. This may take an hour or so, but it is well worth it. This is especially true if you have third-party lenses like Tamron or Sigma, which tend to be further “off”. Now you will be taking sharp photos every time (as long as your shutter speed is high enough). If you have the same camera and lens as I - a Canon 6D Mark II with a Sigma 120-300mm f/2.8 Sports - you are in luck. I have already done the work for you! You can just set the settings to +10 on the Wide (120mm) end and +14 on the Telephoto (300mm) side. If you also have the Sigma 2x teleconverter with this lens/camera combination, set it with the TC to +10 on the Wide (240mm) end and +15 on the Telephoto (600mm) side. I hope you found this article helpful. Let me know if you have any questions, I know it can be quite confusing. I think I played with this for around four hours the first time I ever did it. Sell your old photography gear to make money for new gear. There are two great ways to sell your photography gear. Craigslist is not one of them. To get the “too long, didn’t read” version out of the way, they are Amazon and eBay. The reason I say avoid Craigslist, as well as all the other local sites and apps like LetGo and Facebook Marketplace, is because you will get hundreds of scammers calling you and, likely, not a single serious buyer. Your text messages and call logs will be filled with people trying to just buy it now for your highest price and they will pay you with PayPal. These PayPal payments they send you will look just like the emails you receive from PayPal when you are paid, but they will be forged and link to a website that looks like PayPal but will steal your information. Then you will unknowingly send off your $5,000 lens and be out a lens and the payment. No bueno. That’s why I like to stick with the two big players. Even though they both take about 10% from your sale, the extra cost is worth it to have them deal with the payments, handling, and any returns. This way you know that people are legitimate when you make the sale. So, to start listing your items on both of these sites you will first need to make an account. For eBay you can do that here, and for Amazon Seller Central, click here. Once that’s done, take a few good pictures of your item (that shouldn’t be hard, you’re a photographer after all) and upload them to your sales page so buyers can get a sense of what they are buying. For the description, I like to take snippets of the manufacturer’s description, since they spent thousands of dollars on good copy and it’s there for the taking, as well as write my own specifics on the particulars of my item. Then just hit post and wait for the buyers to come. This could take days or months depending on the item, the asking price, the quality, etc. Be patient. Selling at a good price is very much a game of patience. Think of the lowest number you are willing to accept before posting and write it down. Put it on your wall if you have to. Don’t go below that number. It will sell for the price you want if you give it time. Let me know if you have any favorite places you like to sell in the comments below. Left to right: Patagonia Down Sweater, Patagonia Torrentshell Rain Jacket, Amazon Essentials Sherpa Lined Hoodie. These three items make up the entirety of my outerwear. Since I travel frequently, I picked two items (both Patagonia jackets) that can be packed down into their own pocket and stuffed in my checked luggage without taking up much precious space. The other I will wear on the plane to keep warm, and so it doesn’t take up space in my bag (a North Face Base Camp Duffel - M). Just a brief description of how I use these: If it’s slightly chilly I will just wear the down jacket or the hoodie. When it gets quite cold I will wear the down jacket over the hoodie. When it is below freezing, I will add the rain jacket on top, to further insulate, break the wind, and keep any rain or snow off. Of course the rain jacket can be worn alone on any rainy day. A white-tailed deer (odocoileus virginianus) stands under a snow covered evergreen in the winter in Virginia, USA by Ricky Kresslein. Shot at 1/320 sec., f/2.8, ISO 800. Under these I wear a simple long-sleeve shirt (typically a cheap Henley from Amazon Essentials). These three items when paired together have kept me warm in just about any situation I’ve found myself in. For the bottom half of my body, I wear long-johns, like these from Patagonia, and a pair of Air Force camouflage ABU pants, though any camo pants should do. On snowy or rainy days you will want to have something waterproof over these. I haven’t found a good one at a decent price yet (Patagonia makes nice ones but at a high price) so I can’t recommend one. Just search for waterproof pants and you should find something to suit you. As far as accessories, I’ve gone cheap again with an Amazon Essentials Beanie. I tend to go expensive on the stuff that matters and cheap on the everyday stuff if you haven’t noticed. My good jackets are all quite expensive, but the long-sleeve shirts that go underneath I skimp on. I recommend always buying the best when it comes to the stuff that really matters. Gloves are one that I go hard on. I recommend a nice pair of photographers gloves from Vallerret. These will keep your hands extremely warm while allowing you to pop off the finger and work the camera. Make sure you get a pair of glove liners too, so your exposed finger doesn’t go numb. As for socks and shoes, any good waterproof hiking shoes will do the trick, but a nice pair of rubber boots will allow you to wade into creeks and ponds where you may not otherwise be able to get the shot. I like WigWam socks because they last a long time and keep my toesies nice and cozy. 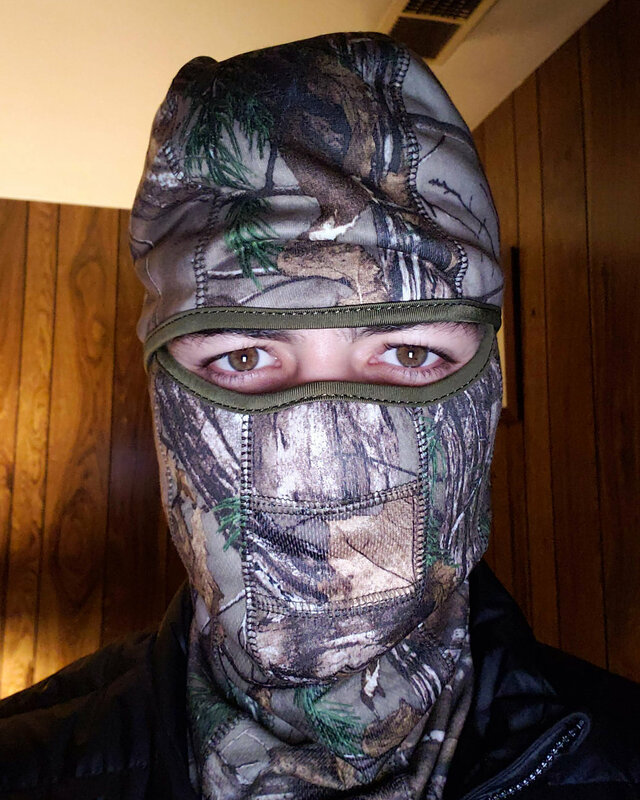 I also just started wearing a camouflage balaclava, and it has been a game changer. Definitely pick one up. My body always tends to be hot while my face is frozen and this thing takes care of that issue. And that’s it. If there is anything I missed, leave a comment letting me know. I’d also love to hear what you wear or if you have any suggestions for things I should add or change. Hope to see you out in the cold! Me shooting with the massive Sigma 120-300mm F2.8 Sports DG APO OS HSM lens with a camouflage LensCoat. I’ve been shooting with the Sigma 120-300mm F2.8 Sports DG APO OS HSM lens now for almost a full year. There are many things I love about it and a couple that I don’t. Those couple reasons are enough that I put it up for sale a couple weeks ago. But I will get to that in a bit. First, there are several reasons that I truly love this lens. The main reason I love this lens is the 2.8 aperture. The difference of having 2.8 versus the 5.6 I had before purchasing this lens is massive. It can be the difference between ISO 800 and ISO 3200. That’s a huge difference and can lead to much better photos. This isn’t always necessary though. Many people shoot foxes or deer in open fields with lots of light. I do not. Most of my subjects last year were monkeys and apes in the jungles of southeast asia. Even in the middle of the day, jungles can be very dark. It’s not uncommon for me to shoot at ISO 6400 at noon. That’s the sole reason I purchased this lens, originally. Cream-coloured giant squirrel or pale giant squirrel (Ratufa affinis) on a tree branch in Borneo, Sepilok, Malaysia by Ricky Kresslein. Shot on Sigma 120-300mm f/2.8 lens at 1/80 sec, f/5.6, ISO 640. Another great thing about the Sigma 120-300 f/2.8 is the bokeh. When shooting an animal up close at 300mm, the depth of field and bokeh is incredible. It’s gorgeous. An f/4 lens will never give you the same quality if you are looking for that beautiful, blurry background free of tree limbs and park benches. But, there is one main thing I hate about this lens—the weight. With the lens hood and no camera attached it is 8 pounds. That’s heavy. Especially when hiking through the jungle and not often having time to get a monopod (much less a tripod) ready before a gibbon swings past. It’s quite common for me to shoot this lens handheld, and that leads to more out of focus shots than I care to admit. After carrying this lens in my backpack on long hikes and through airports for a year, I’m ready to downgrade to something lighter until I can justify spending $6,000 on a much lighter Canon 300mm f/2.8 prime. Until then, I will be getting the Canon 300mm f/4 IS prime lens. Right now it’s going for $600 used on Amazon, which is a steal for what is often considered a solid wildlife lens. 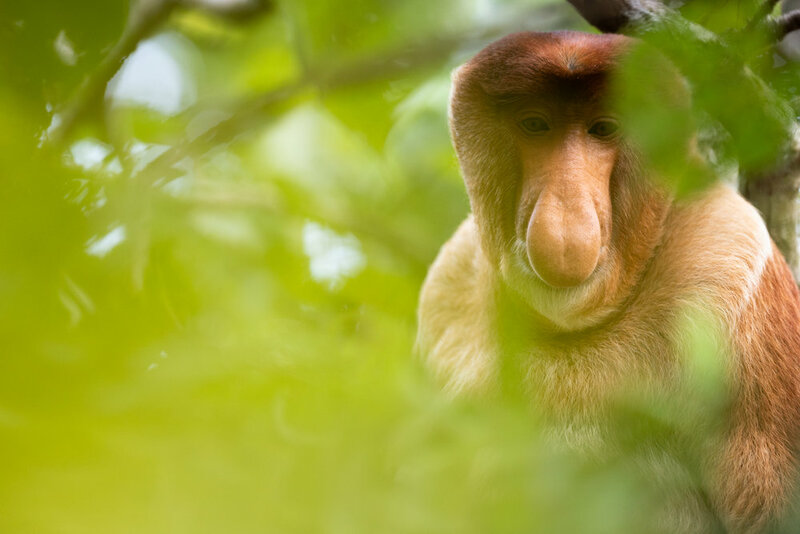 Proboscis monkey (Nasalis larvatus), or long-nosed monkey, close-up portrait in Bako National Park, Sarawak, Malaysia by Ricky Kresslein. Shot on Sigma 120-300mm f/2.8 lens at 1/200 sec, f/3.2, ISO 640. If you are usually shooting on a tripod and you want the option to add a 2x teleconverter to get to 600mm at f/5.6, I definitely recommend the Sigma 120-300mm f/2.8. Again, it’s a great lens. But if you do a lot of traveling, hiking, or handheld shooting, a cheaper, lighter alternative is probably the way to go. Update: I’ve decided to keep my Sigma 120-300mm f/2.8. I realized that getting rid of this lens is not worth it simply because I don’t like that it is heavy. A Canon 500mm f/4 would be heavy too, and I would love to have one of those. This lens allows me to get great shots, so I will be keeping it in my bag. I’ll just have to work out a bit more.